Call us at (702) 458-2243 or come by today! Call us at (702) 458-2243 or come by and see us today! Hill and Dale Child Development Center is a licensed non-profit organization currently serving children six weeks of age through Pre-K without regard to race, creed or disability. Welcome to Hill and Dale Child Development Center! We offer exceptional child-to-teacher ratios in order to boost child and adult interaction. We believe that this interaction between adults and children is extremely important to a child's development, as reflected in our curriculum, and is second only to their safety. We encourage new parents to see what parents are saying about Hill and Dale. Our open-door policy is an invitation for all parents to come in at any time, as long as we're open, of course! Our ever-growing family is always open to newcomers and we would love for you to become a part of it! From all of us at Hill and Dale, we would like to say: Welcome! Hill and Dale offers exceptional child-to-teacher ratios in order to boost child and adult interaction. We believe that this interaction between adults and children is extremely important to a child's development, as reflected in our curriculum, and is second only to their safety. We encourage new parents to see what parents are saying about Hill and Dale. 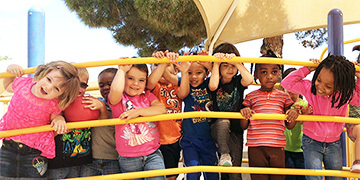 Our staff provides quality child care based around three main ideas: dedication, passion and integrity. It starts with a staff dedicated to the children. In the child care field, high turnover rates are unfotunately all too common. Not at Hill and Dale, though. Our staff averages 10 years of employment. Dedication comes from passion. All of us at Hill and Dale wish to see every child succeed and it is this idea alone that drives us to deliver our best each and every day. We enjoy doing what we do. Integrity allows us to pursue our passion. We understand that choosing the right child care is important for parents, and that nothing short of the highest standard is acceptable, which is why we've built upon the trust of parents and experience with children for over 35 years to create the best child care experience we can. Safety is always our top priority.